Successfully Added Digital Camcorder with Traditional Viewfinder + Bonus Tripod to your Shopping Cart. Digital Camcorder with Traditional Viewfinder + Bonus Tripod. You read that right, a 5.0 megapixel photo and video camera with a traditional style view finder as well as a modern flip out display with active view screen. The CVA-DV91F Digital Camcorder with Traditional Viewfinder + Bonus Tripod makes both videos and still photos. This updated version of our popular CVA-DV91F DV camera is a full kit that is ready to be used right out of the box. What does the kit include? 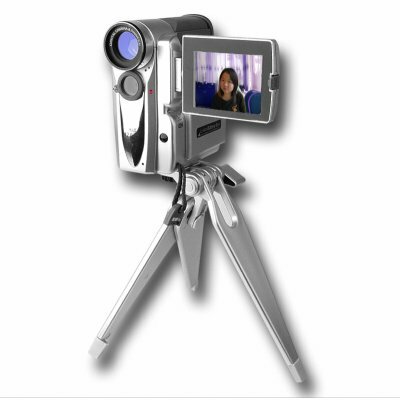 You get the digital video camera (camcorder), compact tripod, carrying zipper case, li-ion battery, remote with snapshot button, LED light module, and all the cables and chargers needed to keep enjoy the action. Just insert your own SD card and you are ready for hours filming ahead! Not only does this camcorder include all the features you would normally expect from the CV brand of cameras, it also comes with value added features such as a dual power system for using either 2x AA batteries or an Li-ion battery, and a snap-on LED light ring for filming at night, making this the ultimate video and picture camera for anyone who wants to keep one in their bag or car so they are always ready to catch the action - day or night. Many every day events can be captured with the CVA-DV91F. Whether you are looking for a good quality all in one kit with a tripod or you need the reliability of a traditional telescope style view finder then you finally have found a new digital camcorder that you can call your own! Many great features, along with Chinavasions low price and excellent customer service and services make this a standout item that is one not to be missed. In stock now for bulk or single piece orders. Digital camcorder with traditional view finder and flip out LCD screen. A full video camera kit that is ready to be used right out of the box. Click "Add to Cart" now to instantly preview shipping rates and have us ship this to you today. What makes this model DV camera better than others on the market today? Aside from the low wholesale price there are two primary reasons - (1) the telescope view finder you use with your eye and (2) the all in one kit makes it easy to store everything in the zipper bag, making this great to keep in your car or drawer, ready to be called into action on a moments notice. No need to quickly scramble for accessories when you need them the most.